Tuculabab camp, Sudan, 1984; Refugees walking for a month through mountains to escape famine in Ethiopia arrive at Tuculabab to find few facilities set up to receive them. Eritrea, 1983; During a severe drought Beniamer nomads water their camels from a shallow well dug into the bed of a dry river. 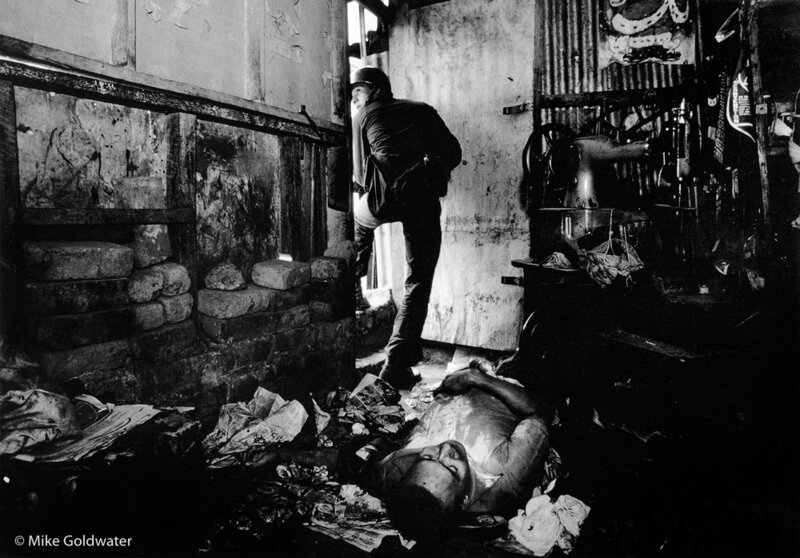 El Salvador, March 1982: A soldier steps out of a tailor's workshop during a battle between the army and guerrilla units in Cuscatancingo, a poor suburb of San Salvador. The tailor lies dead on the floor, killed by a stray bullet. 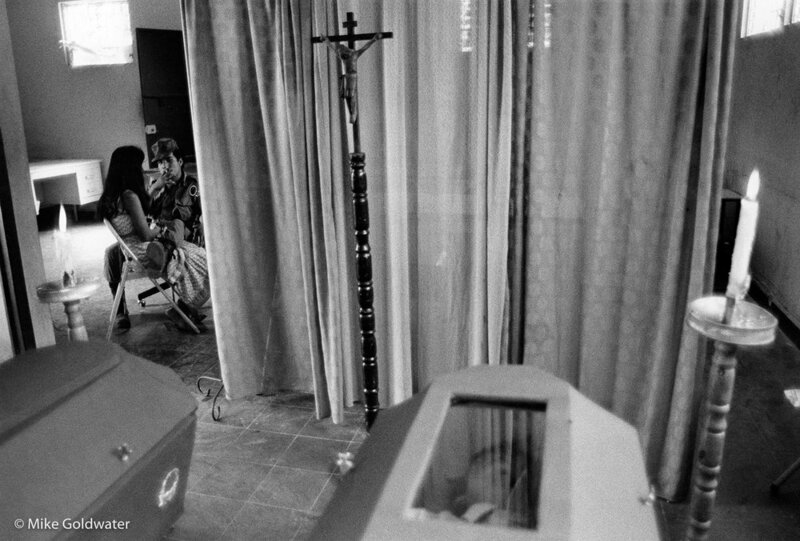 El Salvador, 1982: Temporary mortuary at an army post in Cuscatancingo for soldiers killed in fighting the day before. 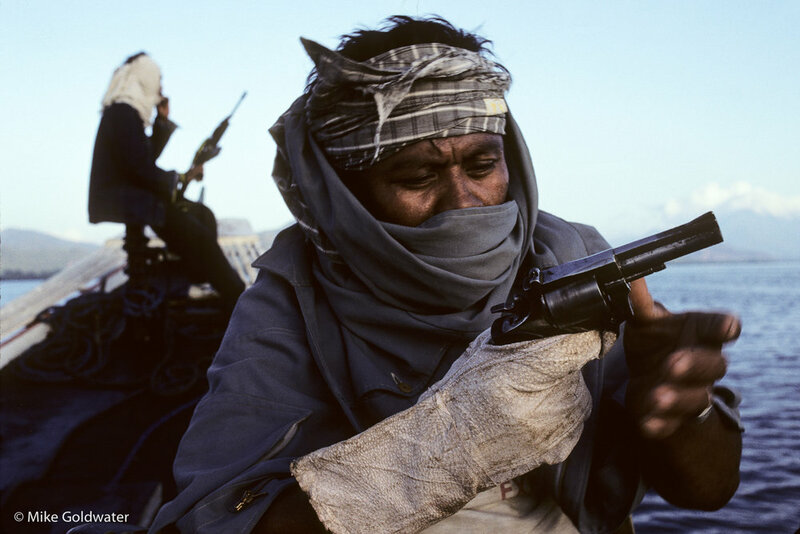 El Salvador 1984: Salvadoran troops cross the river Torola into guerrilla-held territory in Morazan Province. El Salvador, 1984: Soldiers from the Cuscatlan Brigade prepare to carry two of their men, wounded in a guerrilla ambush during an army sweep through a guerrilla-held area in Morazan, to a helicopter for evacuation to San Miguel. 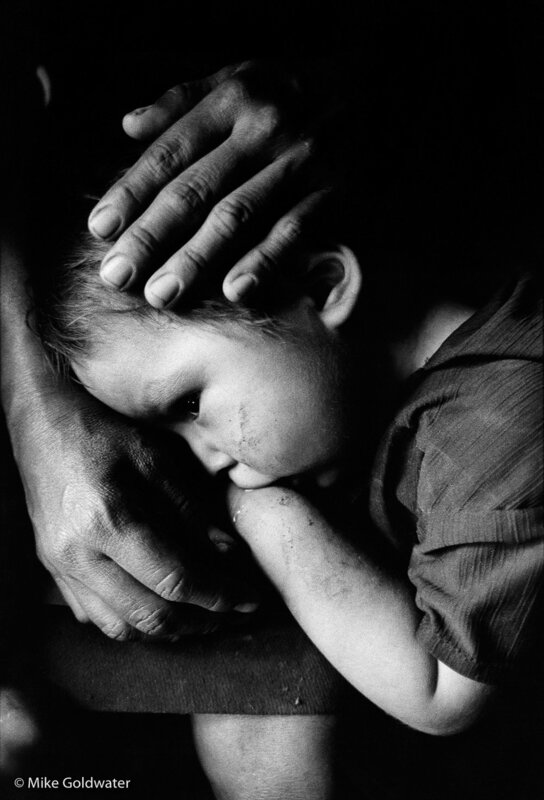 El Salvador, 1984: - A mother shields her child in a bomb shelter during an air-raid by the Salvadorean airfoce on Guazapa - an area under FPL control. 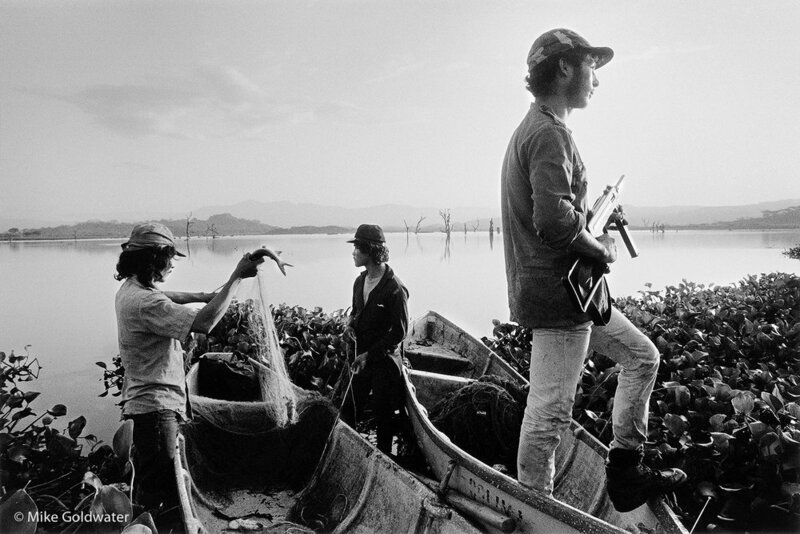 El Salvador, 1984 : FPL guerrillas bring in their catch after fishing all night on Ceron Grande lake, Guazapa. Boats were sunk beneath weed at the water’s edge during the day to avoid detection by the Salvadorean air force. 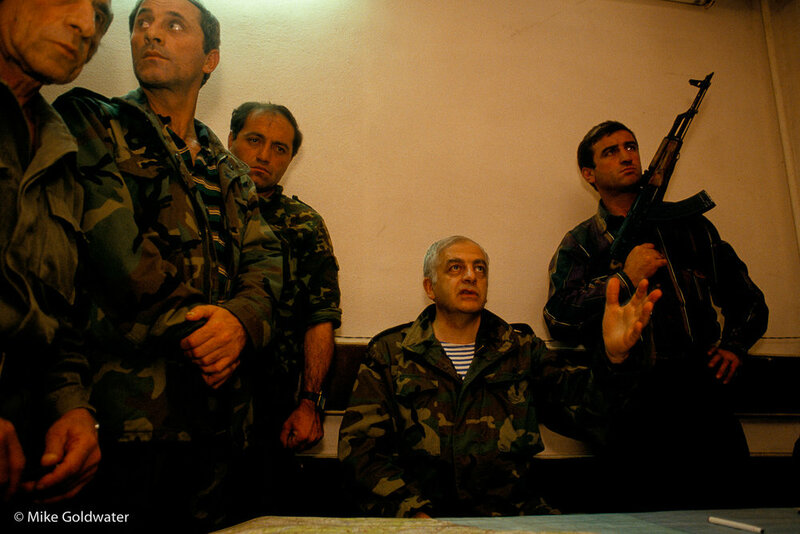 Georgia, October 1993; After the fall of Sukhumi the day before to Abkhazian forces Ochamchire is now a frontline town. Georgians desperate to leave on the last train out of the town crowd onto the cattle-truck. Georgia, October 1993; Government troops, many of them volunteers, retreat from the front line. They were later disarmed by troops loyal to ex-president Gamzakurdia. 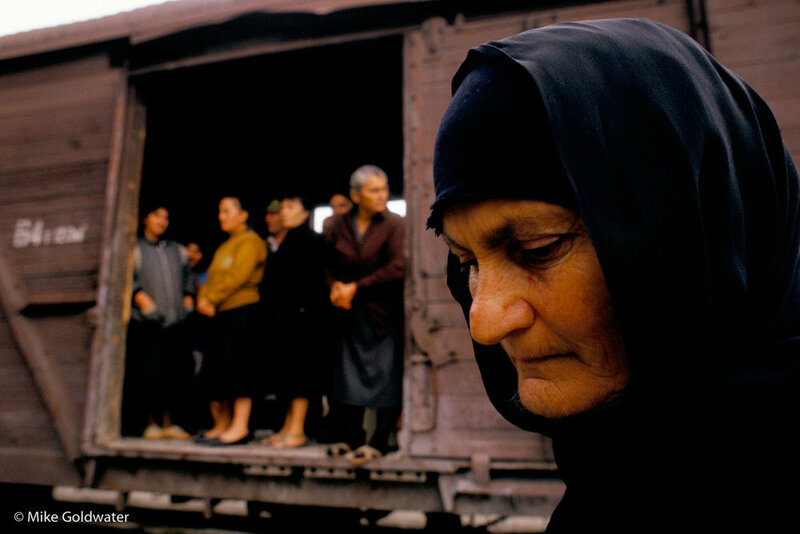 Georgia, October 1993; On the day after the fall of Sukhumi to Abkhazian separatist forces, passengers at Ochamchire railway station wait on the last train to leave south to safety. Georgia, 29th September 1993: Ex-president Gamzakurdia making a brief visit to the military HQ in Ochamchire. By blocking the re-supply of government troops he had ensured that Sukhumi would fall to the Abkhazians. Two days later he abandonded the whole region to advancing Abkhazian forces leaving Geogians to fend for themselves. Ochamchire was the next town to fall to advancing Abkhazian forces. 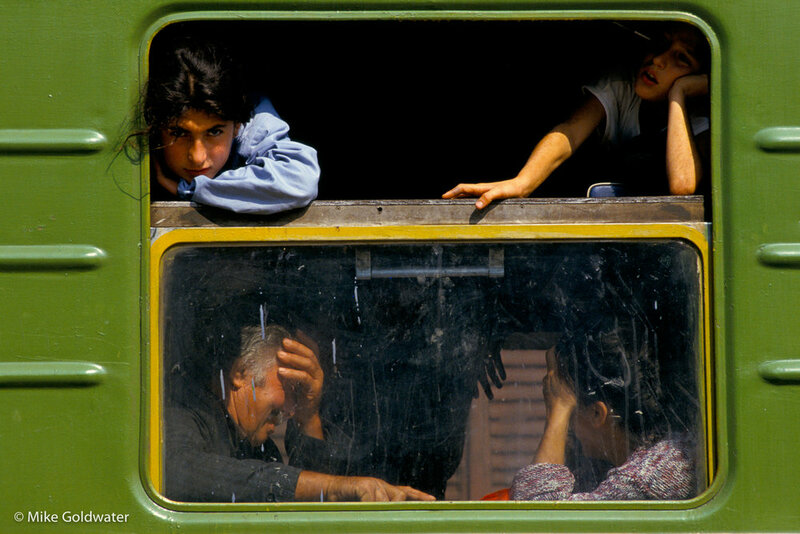 Georgia, September 1993; Fearing an advance by Abkhazian forces further south, this family cross the Zugdidi bridge to relative safety. 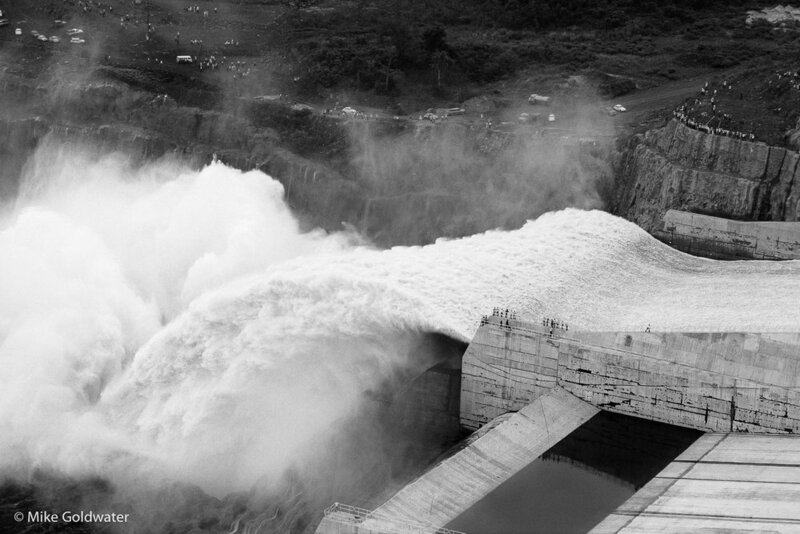 Paraguay-Brazil border, October 1992; Spectators watch as water pours down the spillway of the newly built Itaipu hydro-electic dam for the first time. Providing electricity to Paraguay and Brazil, the dam flooded arable land and displaced 40,000 people. 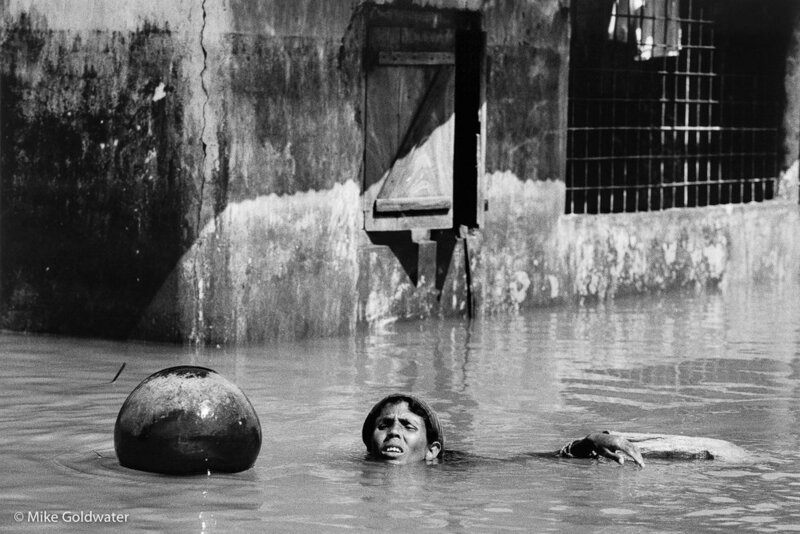 Bangladesh, September 1998: After severe flooding from monsoon rains a woman swims through flooded streets in a Dacca neighbourhood to fetch drinking water. 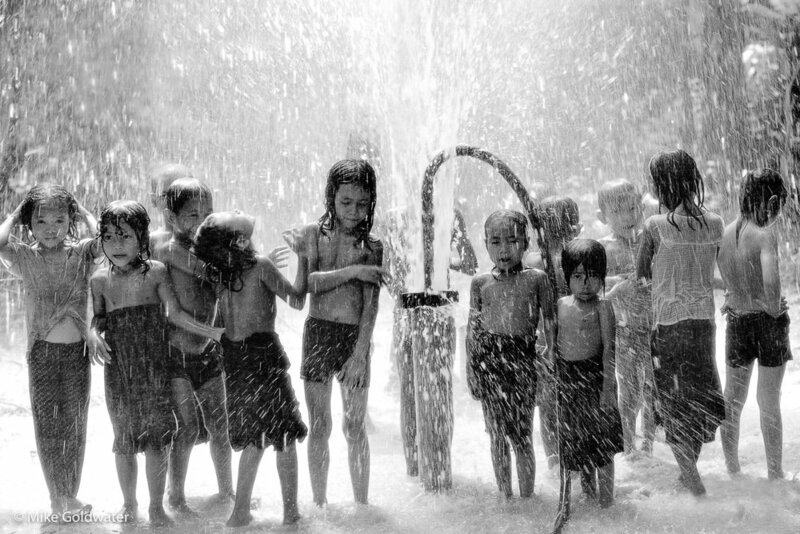 Cambodia, 1987: Children enjoy water pouring from a newly drilled bore-hole that will become their village water supply. Assam, India, 1999: A farmer in Charrapunjee, one of the wettest places on earth with an annual rainfall of over 1,200 cm. Over his back he wears a locally-made rain hood that allows him to have his hands free while he works in the fields. Acre Province, Amazon Rainforest, Brazil: Ashaninka Indians apply face-paint each day, in a design that reflects their mood. Men take just as much care of their appearance as women. River Amonia, Acre Province, Amazon Rainforest, Brazil: One of the chief's sons works thread into a pattern on a hunting arrow. 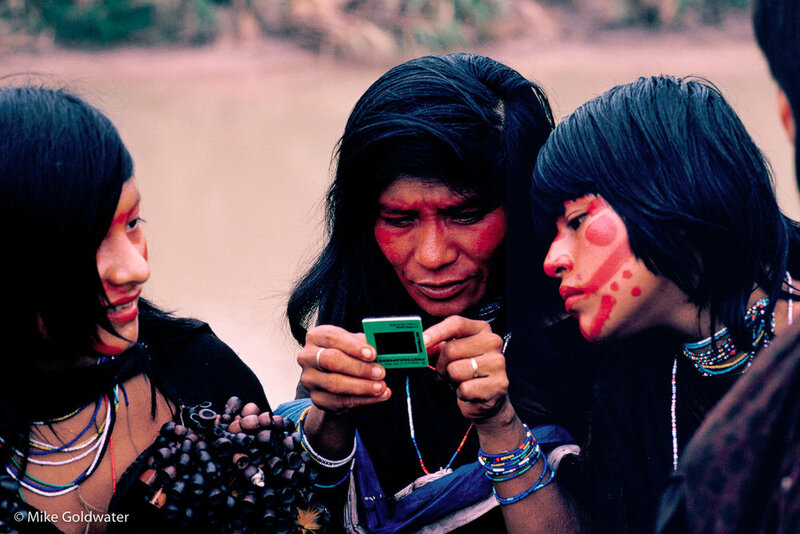 Simpatia Village, Amazon Rainforest, Brazil: Ashaninka women look at slides of their friends and family, taken by the photographer on a previous trip to an Ashaninka community on the river Amonia, a two day walk away. Amazon Rainforest, Acre Province, Brazil: A young Ashaninka boy practices his archery skills using arrows with blunt tips for bringing down birds. Big-Boy checks his gun while Captain Ronnie keeps look-out. The Philippines, 1993: Pirate captain Ronnie points out the way to his crew members. In their 22 meter outrigger boat they make opportunistic attacks on smuggling boats and passing ships and take what ever they can get. 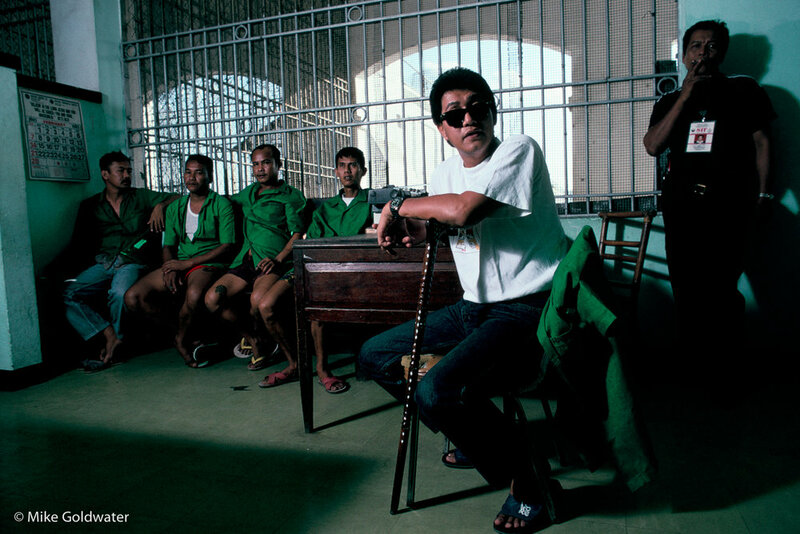 Manila, The Philippines; Emilio Changco, one of the the country's most notorious pirates who masterminded cargo shipping high-jacks at sea, serving life sentence for piracy in the New Bilibid maximum security prison. Chango was shot dead during an escape attempt two weeks after this picture was taken. East Timor, September 1999: As retreating Indonesian troops and militias torch parts of Dili after loosing the referendum that handed East Timor back to the Timorese, British & Australian troops arrive at the scene of a large bank burning on the waterfront. 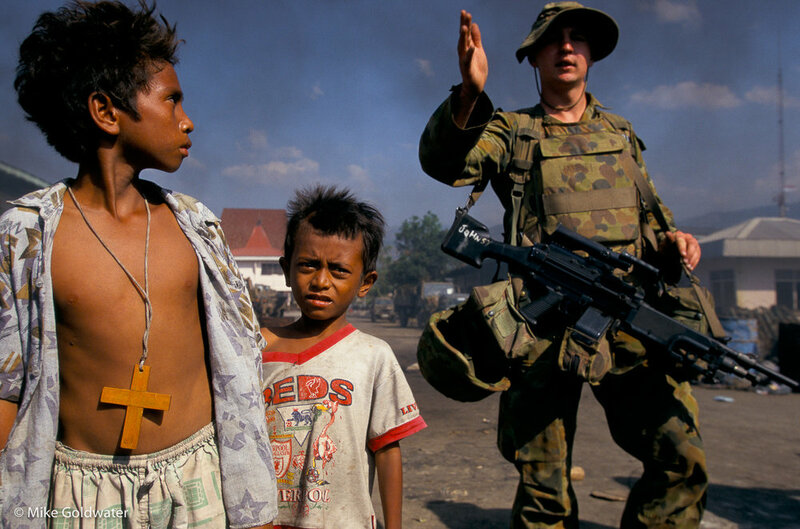 East Timor, September 1999: Displaced East Timorese children take refuge in a camp in Dili protected by Australian troops. 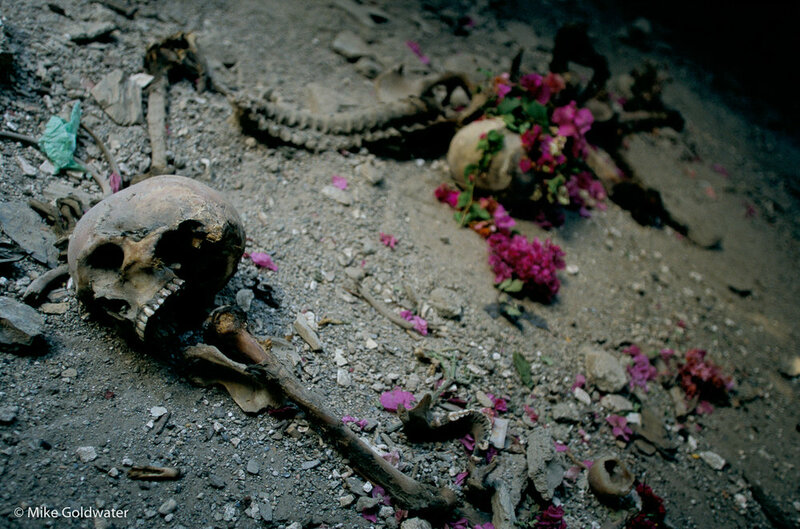 Dili, East Timor, 1999: The remains of murdered people. East Timor, October 1999; In the fist visit by a priest the town of Salamary since the referendum, Father Ramoncita Padilla takes confession. Jukkasjarvi, Sweden, 2002: Adjusting a snow canon that generates snow from which the Ice Hotel is made. Jukkasjarvi, Sweden, 2002: Hans-Peter Strand provides a sauna and ice bathing facilitity on the frozen Torne River for guests at the Ice Hotel. Having cut an ice hole Strand strips off and pats his dog before dropping into the freezing water of the Torne River. 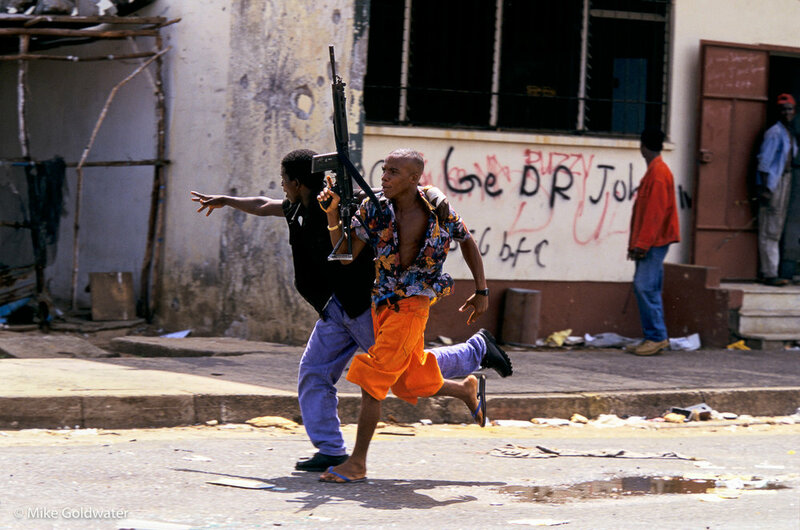 Monrovia, Liberia, May 1996: NPFL fighters loyal to Charles Taylor cruise the streets of Monrovia. Monrovia, Liberia, May 1996: ULIMO-J fighters loyal to Prince Johnson advance from their base in downtown Monrovia to engage the NPFL fighters. Monrovia, Liberia, May 1996: A Khran boy soldier strokes a kitten he has just picked up and looks at the severed head of captured NPFL fighter killed moments before as Ulimo-j fighters advance eastward towards NPFL positions. MONROVIA, LIBERIA, MAY 1996: Ulimo-J fighter winces in pain from a bullet wound caught during street fighting with Charles Taylor's NPFL in the capital Monrovia. 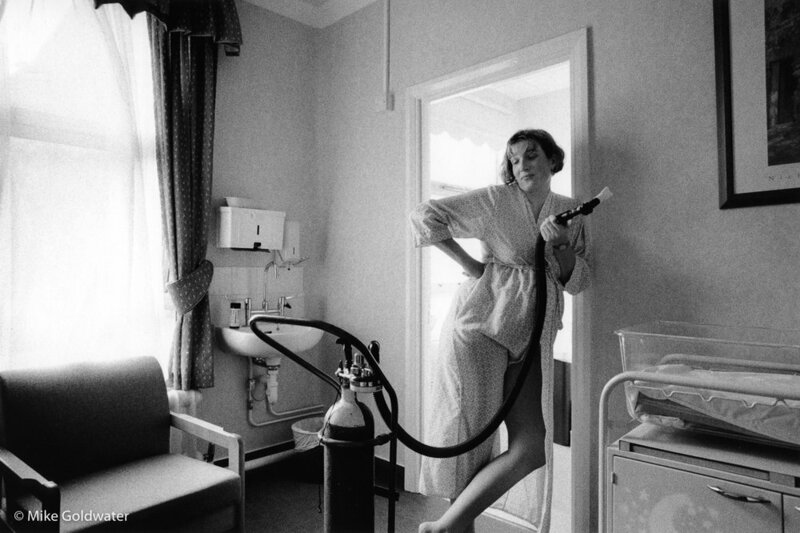 Gail taking gas and air for pain relief after 12 hours of labour, having a break from water bath to let gravity assist - from a set on maternity for the Network Photographers project NHS at 50. Toni's 8-hour labour progresses well in the birthing pool - from a set on maternity for the Network Photographers project NHS at 50. Baby Erin Megan is born after a three and a half hour labour during which Jenny used gas and air only as pain relief - from a set on maternity for the Network Photographers project NHS at 50. Shanxi Province, China, 2007; Young coal workers fill a delivery truck at a private mine at the top of Niu Jia Kou valley, Taiyuan. Inner Mongolia, China, 2007; Liang Yan Fa and Yang Gui Hai add sulphurous coal to the fire at their make-shift suphur factory in the middle of the Wuda coal field. They left their village in Shangdong Province to earn more money here. The Borough Bonfore Society start their firework display, with the "Archbishop" and "clergy" in the foreground. Kurdistan, norther Iraq October 1991; Masoud Barzani's Peshmerga guards keep crowds back as he drives into the town of Dahuk. Dahuk, Kurdistan, norther Iraq October 1991; The crowd celebrates at a rally in the football stadium for the first ever visit to the town by the Kurdish leader, Masoud Barzini. Kurdistan, northern Iraq, October 1991; A girl digs in the ruins of her family's home, in Penjwin. The area was raised to the ground by Iraqi government forces under Saddam Hussein. Penjwin, Kurdistan, northern Iraq, October 1991; Children gather in the remains of a two story building blown up by government forces under Saddam Hussein. Zanzibar, 2017; A fisherman brings in a sailfish he has cought during night fishing for sale at a market at the top of the beach.